Do the Recent Yield Curve Inversions Guarantee a Recession? Click here to download a PRINT VERSION of this article. Since 2006, the only inversions investors studied were inversions involving multi-national companies relocating their headquarters and legal residence to countries with lower tax rates. In January and then again in March, the word inversion meant something else for the first time in 13 years. In January, the yield on the two-year U.S. Treasury fell below the yield on the three-month U.S. Treasury. In March, the yield on the ten-year U.S. Treasury fell below the yield on the three-month U.S. Treasury. Soon after each of these inversions, media headlines announced a recession was imminent. But do the recent inversions guarantee a recession? In this piece, we first explain why an inversion has signaled recessions in the past. Second, we examine the historic occurrence of a recession after an inversion. Finally, we review the present environment to determine how closely the variables in today’s environment match past inversions that resulted in recessions. Yield curve inversions are easy to spot, but more difficult to explain. Spotting an inversion is simple – the two-year, five-year, or ten-year U.S. Treasury yield falls below the three-month yield. But what does this phenomenon imply about the economy? An inversion implies a slowing economy. This can be explained three ways. First and more commonly, as investors begin to predict a recession, they also anticipate the Fed’s response to the recession (e.g. monetary easing via lowering short-term interest rates). Thus interest rates fall today, reflecting the investor belief that interest rates will be moved lower by monetary easing in the future. To a lesser extent, an inversion can be explained by investors shifting to longer-term bonds because they believe short-term rates will fall. An additional explanation is that, anticipating a recession and subsequent weak stock market, investors shift out of stocks and into bonds, leading to increasing bond prices (bond yields move inversely to bond prices). The opposite holds true near the bottom of a recession, when the yield curve begins to steepen. The reason why inversions receive so much press is because historically, a recession has occurred most of the time after an inversion. In fact, since 1960, there have been eight inversions of the ten-year and three-month U.S. Treasuries. A recession followed seven times. In each of those times, the inversion was preceded by the Fed increasing short-term interest rates to slow down an overheating economy. Spotting an inversion, explaining an inversion, and reviewing the history of inversions are all helpful. However, what are the variables and economic environment associated with today’s inversions, and do those variables and environment equate to a future recession? Today’s economic environment and many of the variables are dramatically different from a normal “slowing an overheating economy” based inversion. First, it is interesting to note, that although other major parts of the globe typically invert at a similar time as the U.S. historically, no major countries have inverted in 2019. China has not inverted, Japan has not inverted, the U.K. has not inverted, even Germany with negative interest rates has not inverted. Second, history shows that on average, the Federal Reserve has increased interest rates more than 100 basis points during the year after the yield curve first inverts. Today, the consensus is for 0 basis points in future hikes, and the consensus is actually beginning to lean toward an interest rate reduction being the next policy move by the Fed. Next, the main purpose behind the recent Fed interest rate hiking cycle is more due to the desire to normalize interest rates from the 0% rates during the decade old credit crisis versus attempting to slow an overheated economy. 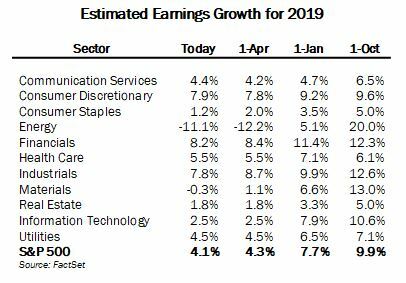 Clearly we are not in an overheated economy since 2019 earnings estimates have fallen sharply over the past six months, and the stock market experienced a classic down 20% bear market last fall. Additionally, prior to the inversion the stock market was pricing in an economic slowdown. Now the defensive sectors like utilities and consumer staples are far more expensive than the value sectors like financials and energy, a valuation dynamic more typical of a recessionary period. Finally, there are typically coinciding market and economic signals at the point of an inversion, such as tightening credit conditions, real interest rates (inflation adjusted) at or north of 3%, and credit spreads widening by 300-500 basis points or more. Today, none of these confirmatory coincident indicators are elevated. An example of credit spreads is shown below. The yield spread between U.S. Treasuries and high yield corporate bonds is 3.84%, which is only up about 0.20% over the last year (see chart below). Our message is a cautionary one about reading too much into a few parts of the yield curve inverting. An investor must ask: Why is the yield curve inverting – overly strong economic growth or interest rate normalization? Why are longer maturity yields falling – recession fears due to future plummeting growth or are extremely low global interest rates acting as an anchor to U.S. rates? Has the stock market factored in economic slowdown risk? Are other countries inverting? Is the Fed continuing to tighten conditions post the inversion? In conclusion, although the track record of inversions foretelling recessions is strong, and today’s reasonably valued stock market could become overvalued, there are a number of important factors that indicate this inversion lacks the typical qualities of past recession signaling inversions. 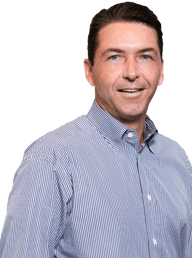 Justin is the Chief Investment Officer for OPCM, and has over 25 years of experience. Justin is a member of the OPCM Investment Management Team, and became a principal of the firm in 2000. Justin is a member of CFA Society San Francisco and CFA Institute. Justin received a Bachelor of Arts degree in Economics in three years and a M.B.A. in Finance from the University of California at Irvine. Additionally, he is a CFA Charterholder. The opinions expressed herein are strictly those of Osborne Partners Capital Management, LLC ("OPCM") as of the date of the material and is subject to change. None of the data presented herein constitutes a recommendation or solicitation to invest in any particular investment strategy and should not be relied upon in making an investment decision. There is no guarantee that the investment strategies presented herein will work under all market conditions and investors should evaluate their ability to invest for the long-term. Each investor should select asset classes for investment based on his/her own goals, time horizon and risk tolerance. The information contained in this report is for informational purposes only and should not be deemed investment advice. Although information has been obtained from and is based upon sources OPCM believes to be reliable, we do not guarantee its accuracy and the information may be incomplete or condensed. Past performance is not indicative of future results. Inherent in any investment is the possibility of loss.